Operating from modest premises on an industrial estate in Abingdon, Oxfordshire, Hewson Consultants was one of the biggest names in the Spectrum software industry throughout the 1980s. The company, founded by Andew Hewson (right) in 1980, initially concentrated on publishing books for would-be publishers (and Hewson himself was to write a popular programming column, "Hewson's Helpline", in Sinclair User for six years). 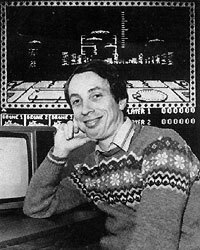 Hewson entered the games market in 1983 and over the next few years published many classic games - Cybernoid, Exolon, Rana Rama, and Uridium to name but a few. During the mid-1980s Hewson was the publisher for the legendary Graftgold programming team led by Andrew Braybrook, the authors of many outstanding games on the Spectrum and Commodore 64. The company did not have a great deal of success in the 16-bit market, although several of its classic 8-bit games (notably Rana Rama and Nebulus) were converted to the Atari ST and Commodore Amiga. It was finally wound up in 1991. Hewson himself returned to the games scene the following year with a successor company, 21st Century Entertainment. This lasted several years, producing a number of memorable games (most notably the Pinball Fantasies series of pinball simulations for the Amiga) before finally going under in 1998.